Mission Success: Costa Concordia Is Vertical : The Two-Way The cruise ship, which ran aground in January 2012 off the coast of Tuscany, will be stabilized and checked to make sure it can make it through the harsh winter. In the spring, the vessel will be floated to a scrap yard. 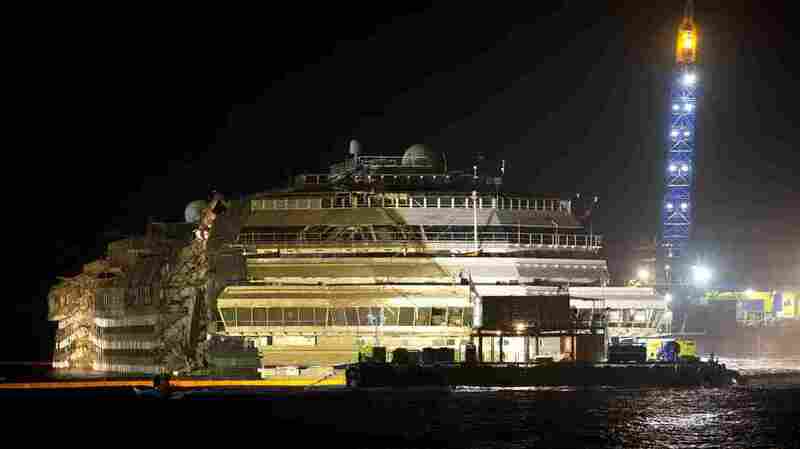 The Costa Concordia is seen after it was lifted upright on the Tuscan Island of Giglio, Italy, early Tuesday morning. Officials declared the results of the 19-hour operation "perfect." In an operation that took 19 hours, the luxury cruise ship Costa Concordia is now in an upright position. The head of Italy's Civil Protection agency, Franco Gabrielli, announced the ship had reached vertical and that the operation to rotate it was complete, according to The Associated Press. The process to right the ship is known in nautical terms as parbuckling. That maneuver is used all the time to right ships but this is the first time it had been used on such a huge cruise ship. NPR's Sylvia Poggioli, who's on the Italian island of Giglio, reports local residents greeted salvage master Nick Sloane as a hero. He led the team of more than 500 divers, technicians and engineers. The ship ran aground in January 2012 off the coast of Tuscany. Thirty-two people died, and two of the bodies have not been recovered. The ship, which is twice the size of the Titanic, will be stabilized and checked to make sure it can make it through the harsh winter. In the spring, the vessel will be floated to a scrap yard. The cruise ship's captain, Francesco Schettino, is on trial for the incident. He's charged with manslaughter, causing a shipwreck and abandoning ship. Schettino claims the reef where the ship ran aground was not on nautical charts.